Heat oven to 350°F. Spray 2-quart casserole with cooking spray. In 10-inch nonstick skillet, melt 2 teaspoons butter over medium-high heat. Cook onions and bell pepper in butter 2 to3 minutes, stirring occasionally. Remove from heat; set aside. In 3-quart saucepan, heat water, half-and-half and butter to boiling; remove from heat. Stir in both pouches of potatoes just until moistened. Let stand about 1 minute or until liquid is absorbed. Beat with fork until smooth. 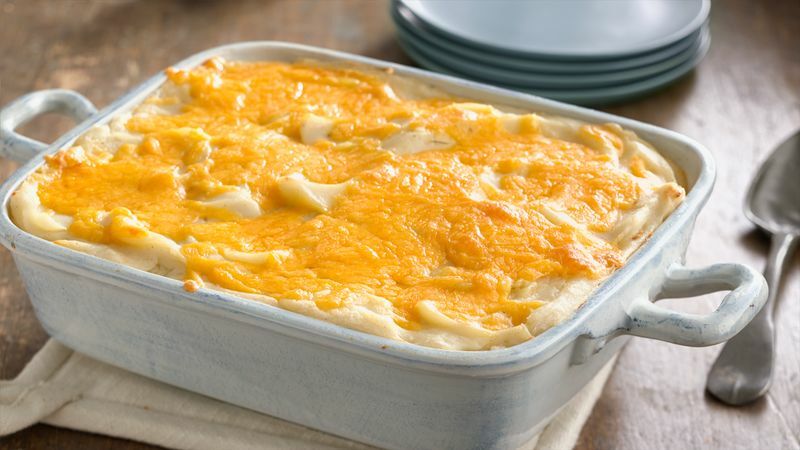 Spoon 2 cups of the potatoes into casserole; top with half of the onion mixture and 3/4 cup of the cheese. Spoon another 2 cups potatoes over cheese; carefully spread to cover. Sprinkle evenly with remaining onion mixture. Top with remaining potatoes; carefully spread to cover. Sprinkle with remaining 3/4 cup cheese. Bake uncovered about 30 minutes or until hot. Make the potatoes up to 24 hours ahead of time, following directions through step 3, then cover and refrigerate up to 24 hours. Bake about 45 minutes or until hot. Half-and-half is what makes these potatoes so rich and creamy. If you don't have it on hand, though, you can use milk for a less creamy version.